The amendments to Russia’s strategic sectors law – which I summarized in this post – have still not been made public, but here a few other developments. I was fortunate enough to co-author the Russia section for the Spring 2010 issue of International Lawyer. Regular readers of this blog will be familiar with most of my portion, which summarizes the application of the strategic sectors law. The entire article is a great read and gives a comprehensive overview of legal and business developments in Russia over 2008-09. The most interesting news for the strategic sectors law relates to Coca-Cola’s plans to acquire 75% of Russian juice producer Nidan (Нидан), maker of brands such as Moya Semya and Da! juices. In my opinion, this is a good purchase for Coca-Cola. First, Russians – of all ages and genders – love their juices. If you go to someone’s apartment, to the extent you are offered a non-alcoholic cold beverage, it is almost invariably juice. Second, Nidan owns some of the most widely-known brands in Russia. Finally, Nidan’s facilities and equipment are generally newer and more modern; not some refurbished Soviet-era junk you might find in the “commanding heights” industries like minerals extraction, car manufacturing, etc. So overall, this seems like a smart strategy on Coca-Cola’s part for expanding into Russia, rather than attempting to bring its existing juice brands to Nidan’s level (I’ve never seen Minute Maid for sale in Russia) or to change Russian tastes in favor of soda beverages. Coca-Cola had previously attempted to compete directly with Russian producers – e.g., its line of kvass launched in 2005, which the company recently started to sell stateside (unlike Russians, Americans will typically drink any water + sugar combination you offer them). Now, you may be asking yourself, what does a juice company have to do with the strategic sectors law? According to Deputy Head of the Federal Anti-monopoly Service (FAS) Andrei Tsyganov, it is because Nidan is licensed to do work with food bacteria and the conduct of microbiological research. This puts Nidan in the general category of industries related to research, production, and distribution of biological weapons. The Coca-Cola application has apparently been received but is not under active consideration. Assuming it goes to the Governmental Commission – and I think it will – this will be the first time an American company has run the strategic sectors gauntlet [that we know about]. But this is not the only reason that Coca-Cola’s application is unique and significant. Indeed, it also (i) is not a purchase by offshore holding companies owned by Russians, which have made up the majority of deals so far; (ii) does not involve the military sector, where deals are often negotiated on a bilateral level, making Commission approval a mere formality; and (iii) does not involve the extractive industries, which have their own peculiar legal, political, and economic factors. Rather, this investment is by a major global (American) corporation into Russia’s promising, yet relatively untapped consumer sector. Thus, it will be watched closely here in the U.S. as a litmus test of Russia’s alleged commitment to supporting foreign direct investment. My own prediction – Coca-Cola’s application will fly through without incident. 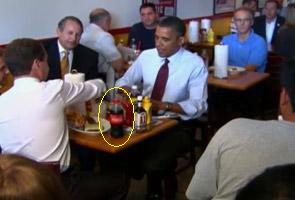 After all, the company has promised to invest up to $4 billion in Russia if the country will host the World Cup in 2018, and, most important, Medvedev appears to prefer Coca-Cola (see picture above via ndtv.com). This entry was posted in coca-cola, FAS, nidan, strategic industries. Bookmark the permalink.